Forex4Money is a forex broker. 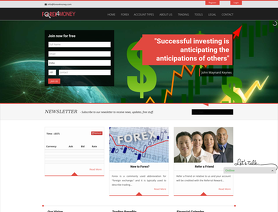 Forex 4 Money offers FXnet Platform and Mobile trading platforms. Forex4Money.com offers over 5 currency pairs, CFDs and Binary Options for your personal investment and trading options. we have request to all trader if you have any issue kindly mention your trading account number also we are in the global market so we cant do any manipulation. When the time comes for withdrawl the process is very slow and lengthy. Moreover the support team promises that the amount will be credited within 2 to 3 workings days after the first withdrawl but the same doesnot happens at all. They try to avoid the process of withdrawl at the same time they offer various lucrative schemes for making money and get an account opened so that an amount of money gets credited to their account. People should not go with this company. they will only deposit money and will not withdraw your money. be alert from akshay singh, rahul jain, ankita, anita all these are biggest fraud, never trust them, it is my duty to alert you all as i am victim.and i am filing a criminal case against this fraud company. do not waste your money and time with this fraud forex broker. I am not fraud Ok, I am responsible citizen of india and it is my duty to alert public from your type fraud and scammer company which is cheating innocent public. The biggest fraud, Liar and Cheater is your Director and CEO Akshay Singh who is operating this fraud company using fake name, I know his real name is Jitendra Singh not Akshay Singh. I know you cheated me and many people and you will not return our money easily that is why i and other victims are going to file a fraud criminal case against your fraud company. We have sufficient proofs to prove that you are a fraud, liar and cheater company, Do not worry i will see you in court soon. I will take my full deposit money with double interest with mental harassment charge. I will send you all in Jail IPC 420. Do not waste time and money with this fraud dabba trading company they are not going to pay you your profit so do not waste time. They will do all effort to make you loss, they will do website manipulation , they will manipulate your account balance and when you ask for withdrawal they will reject your withdrawal request and will not give more than 100 - 150 USD. The real and demo account both are same. they are making fool to innocent public and cheating their hard earn money. I am a victim and it is my personal experience. So alert from this type of dabba trading company. Reply by forex4money support submitted Feb 15, 2018 Dear Sir, We are able to comprehend your apprehension however we are the VFSC base broker and whatever name you are using are our employee and we are totally unaware from the fact that what they have done and we don't do any management on the platform for the reason that we are working in global market and weren’t getting any complaint from our customers irrespective from India. So, if you face any problem you can contact us through our email Id which is support@forex4money.com or you can also contact us on our customer support number which is mentioned on our website. And we will entertain your entire question. Please do mention your trading account number and in the case of any deception you can take legal action but our company is legally verified by Certification of Forex. You can also search our license. If you have trading account, we will suggest you to do trading and we give assurance of your profit. Which you can get within 2-8 hours in case of paypal and in case of bank you can receive profit in 2-3 working days in USD. Our company has come to know about the scammers who are indulging in giving false feedback and they also give their numbers. And as a result when you contact them they will provoke you to join their company. And you also lose your amount while investing in that. Therefore, don’t trust any such person as the company has a good reputation and the company is giving its service to all the people since one year. And have gained much respect and trust of the people. We Hope you can understand this. Am doing trading in forex4money n getting profit.....it's prafact way to get profit in dollars. Great experience. I got so good support from Forex4money team to earn money. Please Refer company's Reply in my previous posting. They are telling that it will take 15days for first tme withdrawal in this reply, I have applied for withdrawal on 7 th July. Toady is 31st July. Till today I did not get withdrawal so for. So Irequest all the Traders please don't do trading with this Very Big Fraud Broker. This Broker is not giving withdrawal. When approached for withdrawal no response received.Very Bad Broker. Very Very BAD Broker. This broker not giving withdrawal even after 9 days.No response from Broker when approached for withdrawal Please don't loose your money with this Bad Broker. This Broker is not giving withdrawal even after 14 days. While depositing money they told that withdrawal will be processed within 24 hours. But they did not respond to my request over phone call, Skype message and email. Whenever I contact them over Phone, Skype,etc they are not talk with me. I get the reply as "wait"
So here after please don't deposit with this Bad Broker. Jul 19, 2018 - 1 Star Very Very BAD Broker. This broker not giving withdrawal even after 9 days.No response from Broker when approached for withdrawal Please don't loose your money with this Bad Broker. This Broker is not giving withdrawal even after 9 days. While depositing money they told that withdrawal will be processed within 24 hours. But they did not respond to my request over phone call, Skype message and email. So here after please don't deposit with this Bad Broker. can you help us with your email id and trading account number so we can check your account details. Thank for trading with us. After giving your withdrawal as per our term of business you have got your withdrawal and your withdrawal was delay coz of your bank account name miss match so form next give proper details of bank account. So you will face any issue on withdrawal. I am doing trading with this company form last 6 month and getting good support and withdrawal they giving with 4 to 5 working day in INR. forex4money is 100% fraud company and never trust this company this company only make fool to all people. they do not give any type of withdrawal , they only make fool. all person in this company is fraud , cheater and very very big liar. I need proper response to any one pls gudie to me..
as your account is into fund management (Pamm) account and there was less profit came in account but as this month you got the good withdrawal as per our record. Kindly suggest us if not get the withdrawal of your profit.